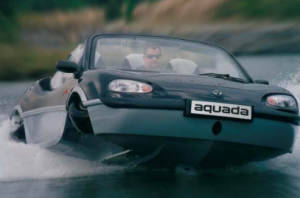 Launched in 2003, the Gibbs Aquada is capable of reaching speeds of over 100mph on land and 30mph on water, achieving powerboat functionality and even capable of towing a water skier. This unique achievement is made possible through the combination of a 2.5 litre, 175-bhp V6 engine and a proprietary jet propulsion system, which kicks into action at the touch of a button when moving from land to water. The Gibbs Aquada already boasts a strong order list with one famous owner, Richard Branson, recently setting the world record for a channel crossing in an amphibious vehicle – just over 90 minutes! The success of the Gibbs Aquada has also spurred the development of the 350-bhp “Gibbs Humdinga”, a four-wheel drive HSA concept vehicle. Innoval was chosen by Gibbs for our aluminium expertise. We were asked to audit their suppliers’ processes, to undertake detailed surface characterisation studies and to conduct a mechanical test program in support of Gibbs Technologies’ patented lightweight aluminium structure. This can now be found within the Gibbs Aquada – the world’s first High Speed Amphibian. We acted as an independent expert body to test and confirm that the aluminium pre-treatments used within the production process met with the appropriate industry standards. This involved visiting Gibbs’ suppliers and providing detailed scientific evidence confirming metal treatment processes were within specification. With a PhD in Polymer Science and 27 years experience, Colin knows a lot about polymers and coatings on aluminium. His product experience encompasses painted sheet, foil, packaging and automotive applications. We chose Innoval to carry out this important work because of their expertise in surface treatment and structural adhesive bonding. The Gibbs Aquada is designed and produced to the highest levels of quality and safety, and we trusted Innoval to perform to the same exacting standards.